DRUMJECTOR features a really creative toolset for drumloops, drum hits, glitched percussions, and fragmented rhythmic elements! Over 1,000 samples are included. No matter what level of production skills you have, whichever DAW you use, this toolkit will get you adding unique beats and rhythm(s) to your tracks in a new, fun and productive way. DRUMJECTOR also includes over 150 KEY-LABELED kick drums for all EDM genres! Genres this is useful for making: Glitch, Drum and Bass, EDM, Dubstep, Drumstep, Downtempo, House, Electro, Progressive, Breaks, Dub, Glitch-Hop, Techno, etc. “DRUMJECTOR” is 100% royalty free, meaning you can add all of these elements to your sound without worrying about any sample clearance hassle! 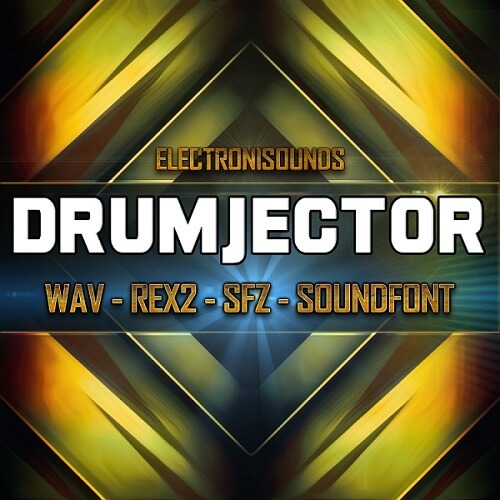 Included formats: WAV, REX2, SFZ, SOUNDFONT — Compatible with ANY and EVERY DAW! EVERY KICK DRUM SAMPLE IS KEY LABELED. ALL LOOPS ARE TEMPO LABELED.